The first is Basic, which consists of Mailchimp’s default starter emails. 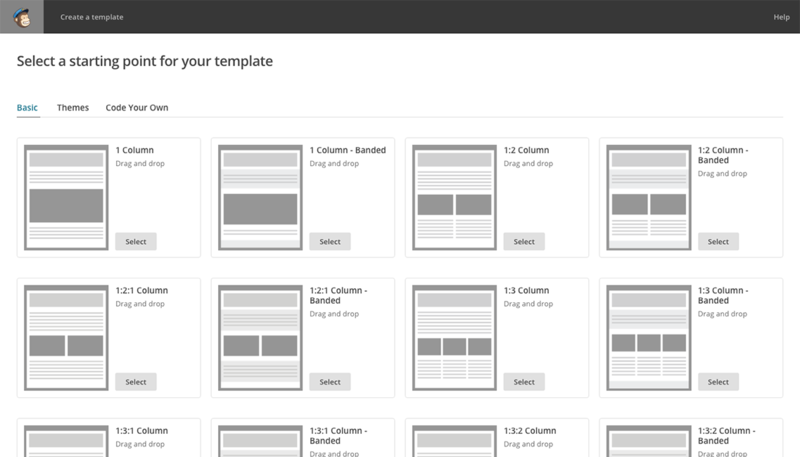 These emails are all responsive, and you can use the drag-and-drop email designer to build them to suit your needs. 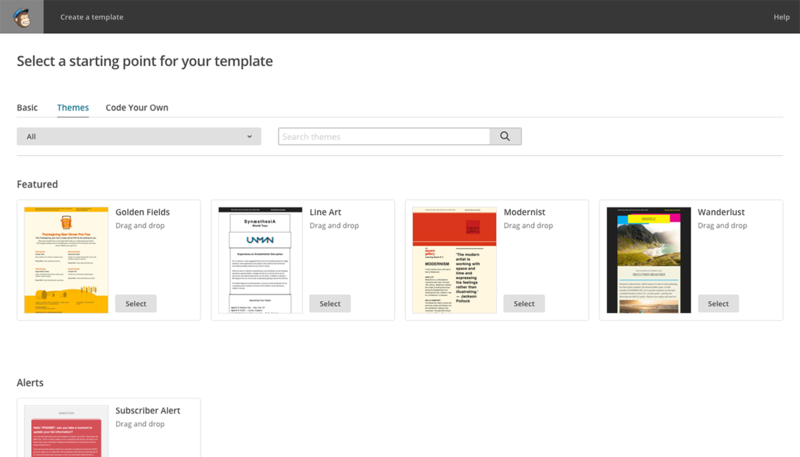 The second category, Themes, contains templates that have their unique designs already applied. These templates are also responsive and compatible with the drag-and-drop designer, and you can tweak the designs to better match your vision. Paste In Code, where you can use an in-browser text editor to paste or write code for your template. While coding, you can watch the automatically-refreshing preview pane to check your progress. If you’re using the template language to set up editable styles, you can then make changes within the design pane. You can also send test campaigns, run inbox inspections, and access the file manager to add images and files to your email - all without leaving the editor. Import HTML: If you’ve got an email already built, you can import it into the template dashboard with this option. Just browse for your HTML file, give the template a name, and we’ll drop you into the email editor where you’ll be able to make any changes you need. Import Zip: You can also add an email to the template dashboard via .zip file. Include your HTML and images in the file, and Mailchimp will do the rest. Images will be uploaded to our servers, and the relative links in the code will be automatically converted to absolute links.